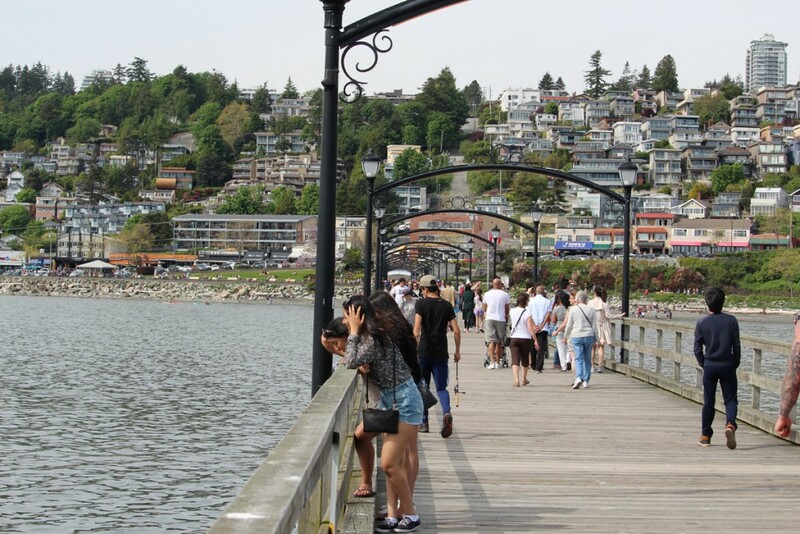 The area comprising Vancouver and many of the surrounding towns and cities extending to but not including Mission, B.C. 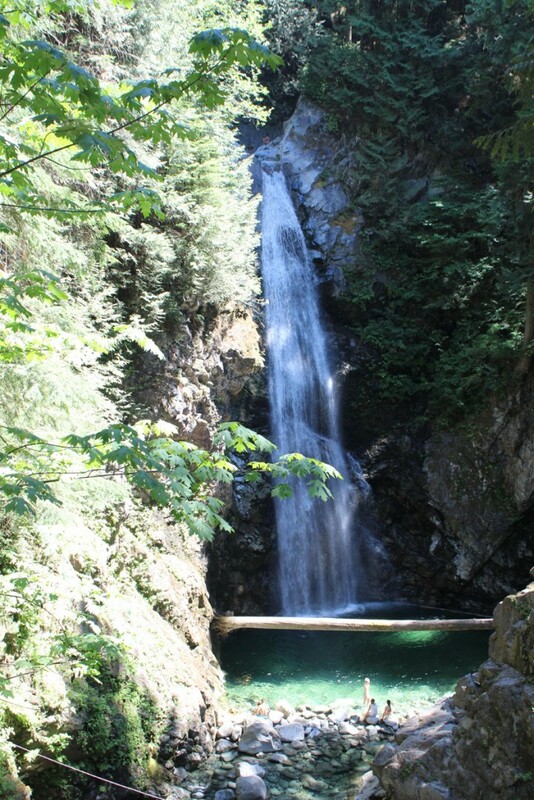 and Abbotsford, B.C. 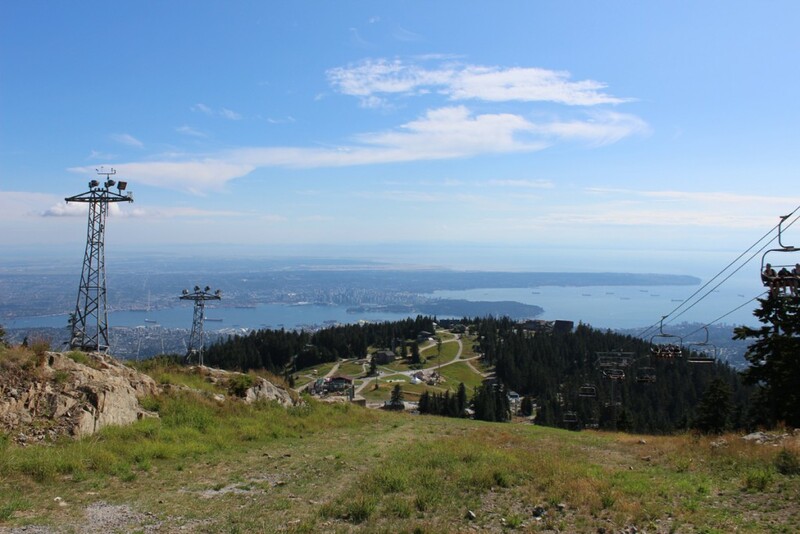 North Vancouver’s Grouse Mountain is a popular ski hill for locals but it is also a great destination for visiting in the summer. 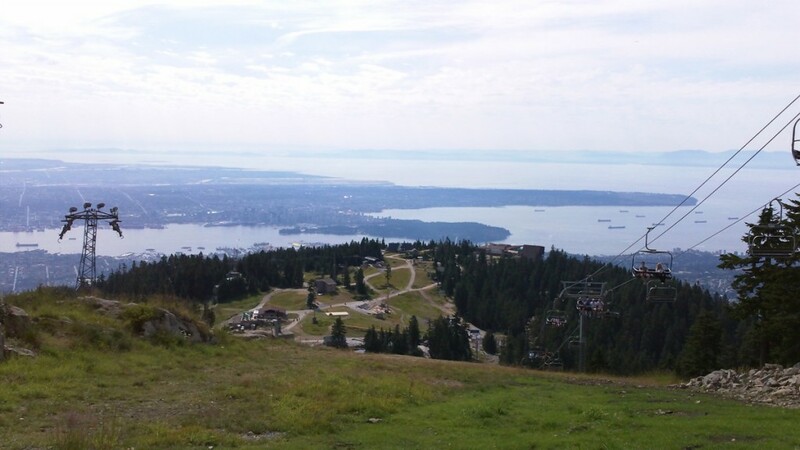 Not only is the view of downtown Vancouver spectacular from up there, the ski resort has a lot of amenities to appeal to the summer visitor. 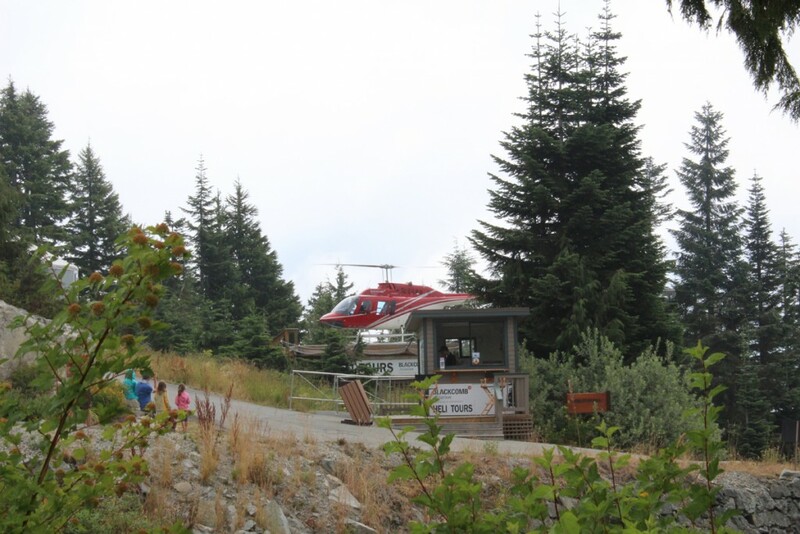 There’s even a helipad on the mountain if you want to take a scenic tour of the city by air. 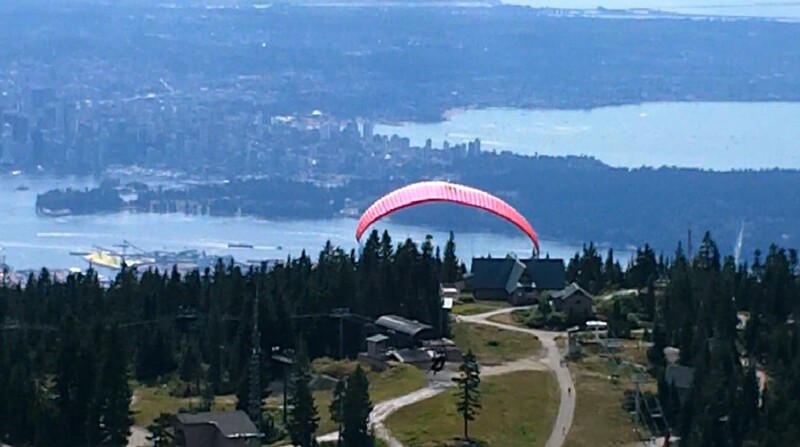 Helicopter tours of the city are available on Grouse Mountain. The fun starts, of course, with getting there. 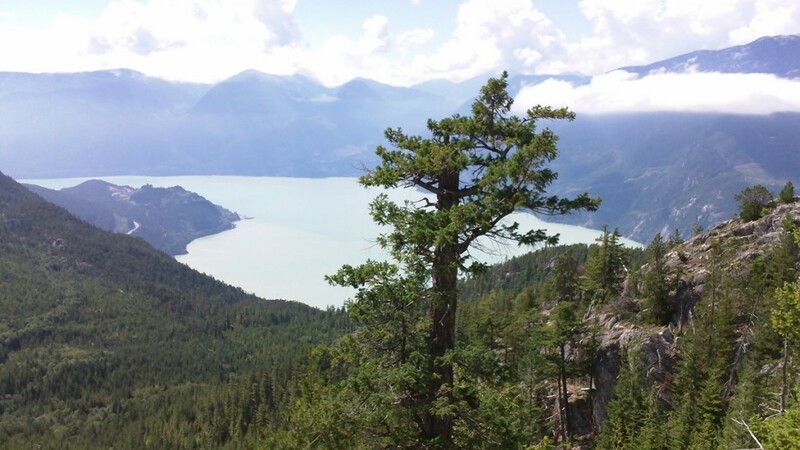 Whether you go by car or are on a tour bus, your visit starts at the base of the mountain. From there it’s a scenic trip to the top of the mountain on one of the two cable trams. Upon exiting the tram you’ll find the ski lodge ahead. It features several restaurants as well as some shops. Clothing, cameras and souvenirs, and in the winter you’ll find ski gear. The view from the restaurants is breathtaking. But we’re not here to eat yet. Let’ saunter down the trail to see what we can find. 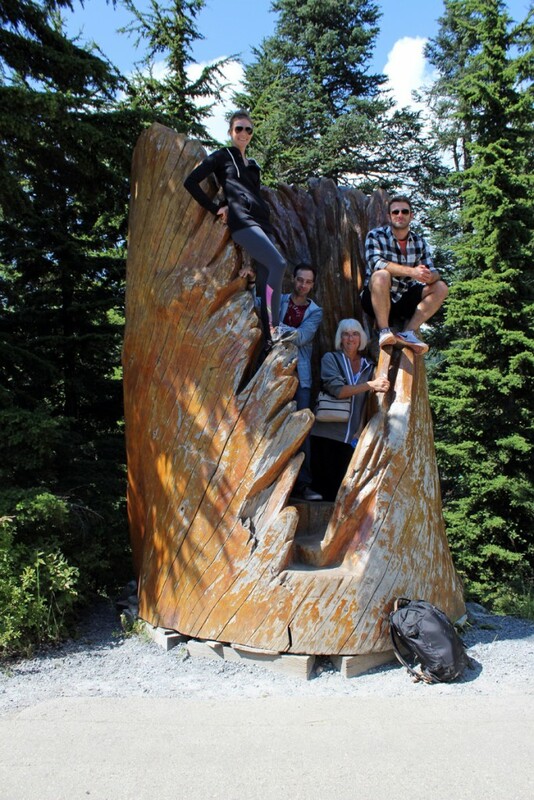 Walking amidst the tall cedars we come across some large wooden sculptures. Figures of tree planters. 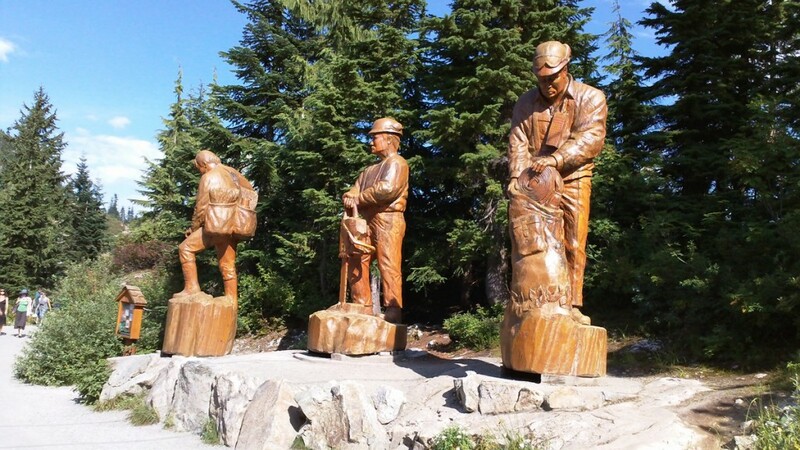 Giant wood carvings of tree planters. 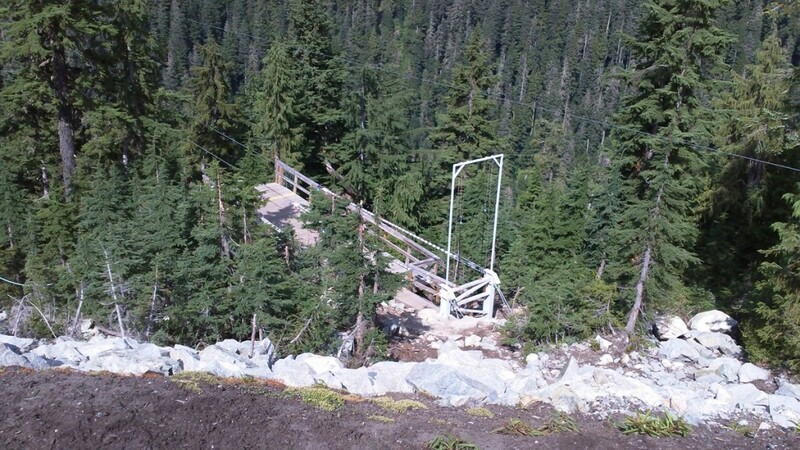 Behind the third one is the launch platform for one of two ziplines on the mountain. You’ll also find a large hollowed out carved stump. A popular spot to pose for pictures. The giant hollowed out stump. Left to right: daughter Sarah, son Adriaan, my wife Janis, and our daughter’s fiancé Jamie. Just over the rise we come to a large meadow in a shallow valley. Here you’ll find the popular Timber Show. 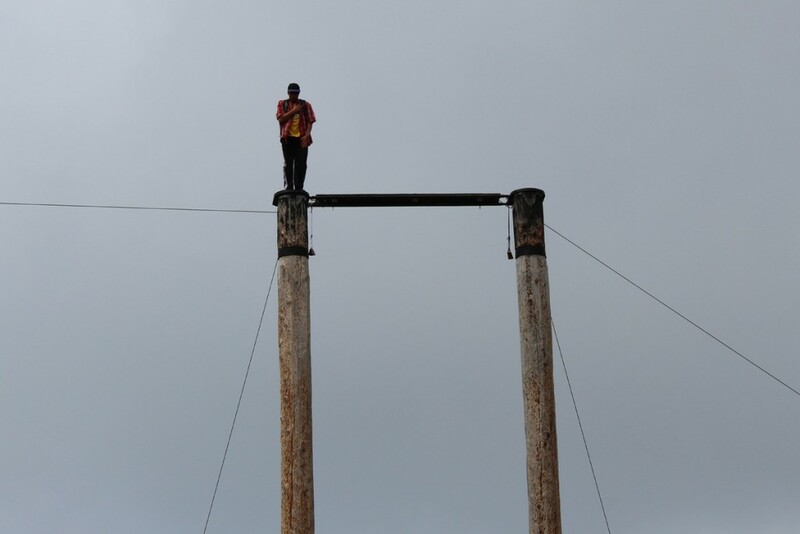 With shows several times a day, the Timber Show is a humor filled display of woodsman skills, including a climbing competition, log rolling competition, and chainsaw exhibition. Off to the left is the large bear enclosure. A couple of large grizzly bears live here. You might have to look around for them as there is a lot of wilderness for them to hang out in as well as a bear house. 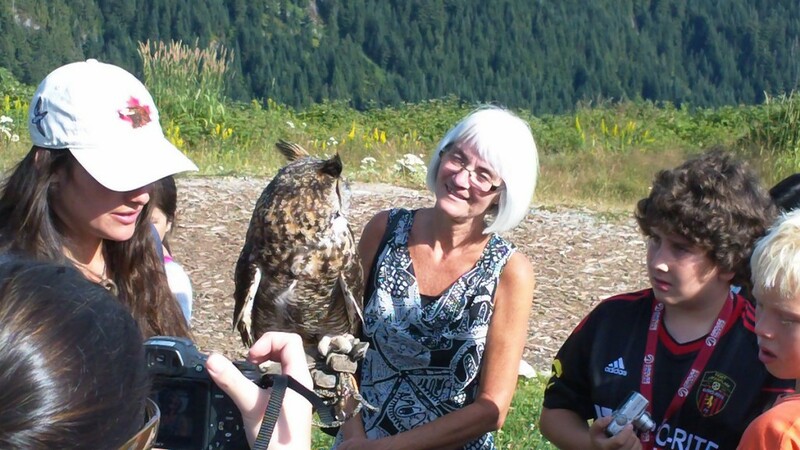 We visited Grouse in the summers of 2012 and again in 2015. 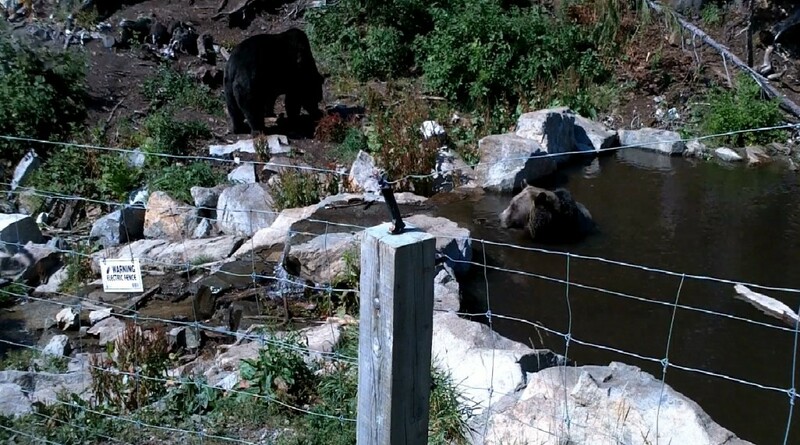 On the first trip we spotted the bears on returning on the chairlift from the Peak. 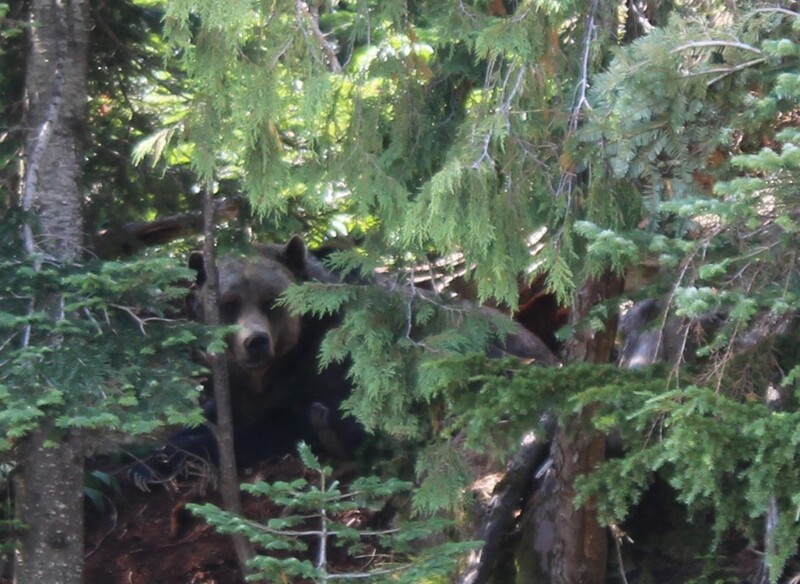 We spotted these grizzly bears from the chairlift to the Peak in 2012. 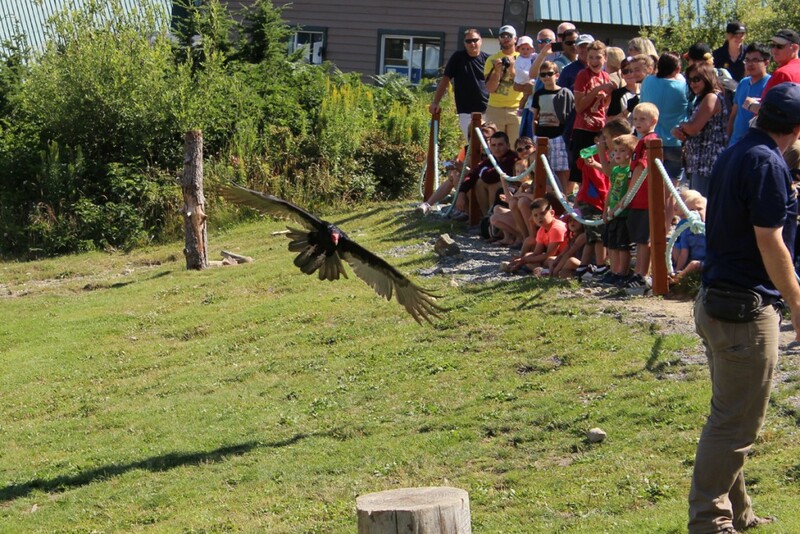 The crowds love to see these large animals. 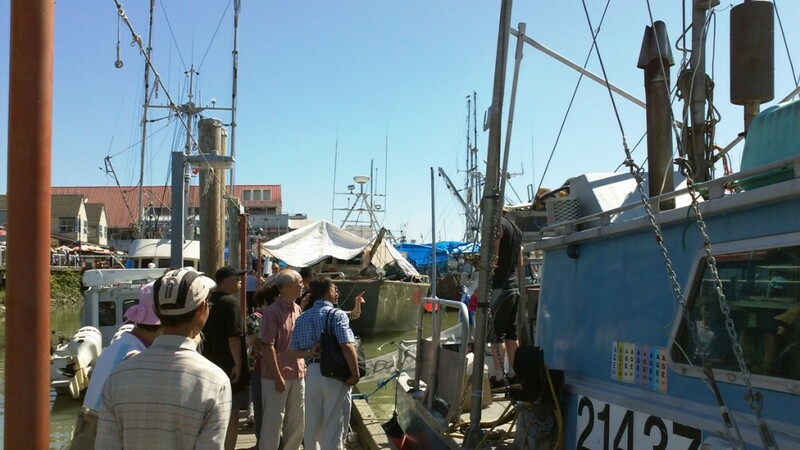 This shot has been cropped from a larger one. 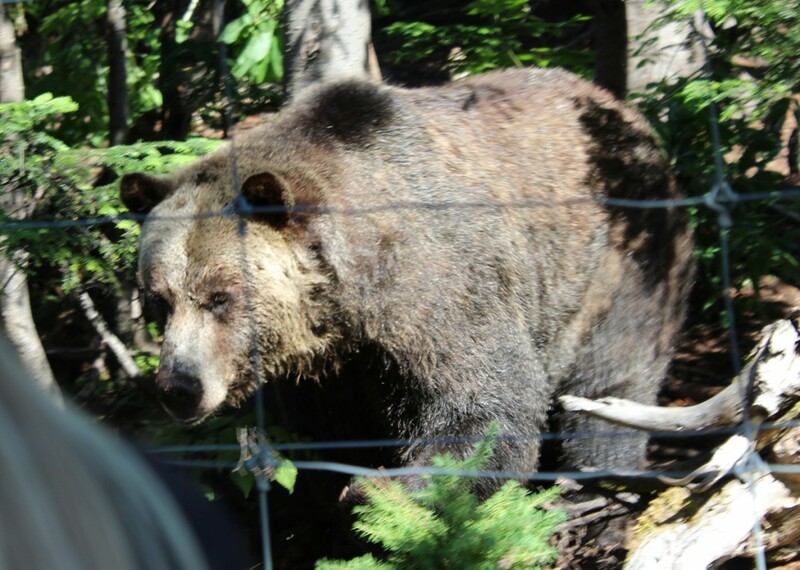 The bear was up a hillside and in the woods. 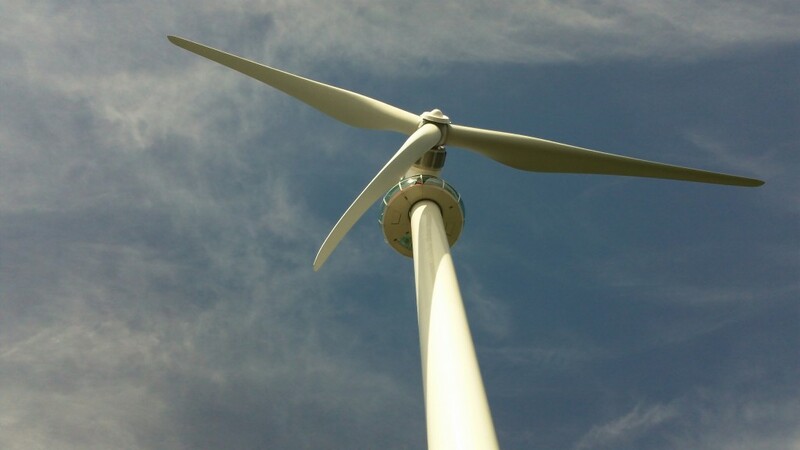 At the top of the Peak stands a wind turbine with an observation deck high above the mountain. Appropriately enough, it’s called The Eye of Vancouver. 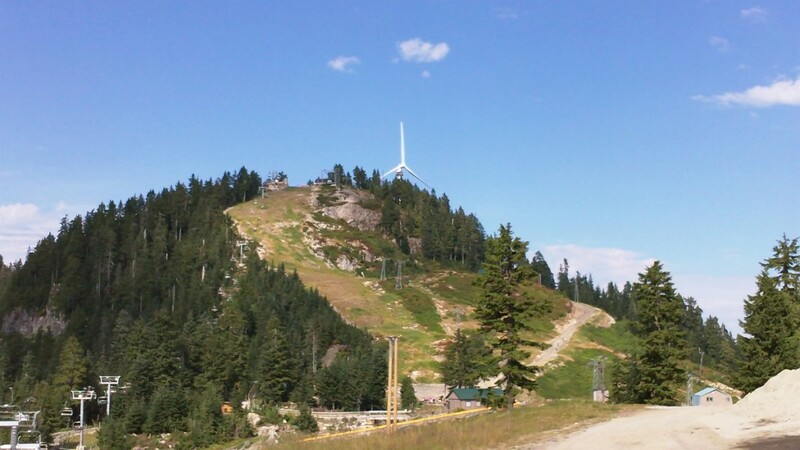 We took the chairlift up to the top to check it out, though we did not go up the turbine itself. Maybe another time. The view must be amazing. 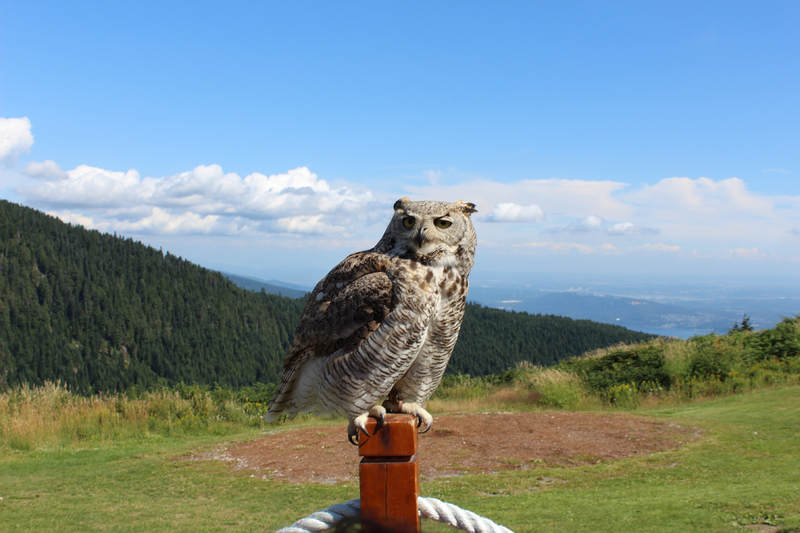 Even if you do not go up to the observation deck, the view of the surrounding mountains as well as the city is excellent from the ground. Worth a walk around. There is also a zipline on top. One of two on the mountain. 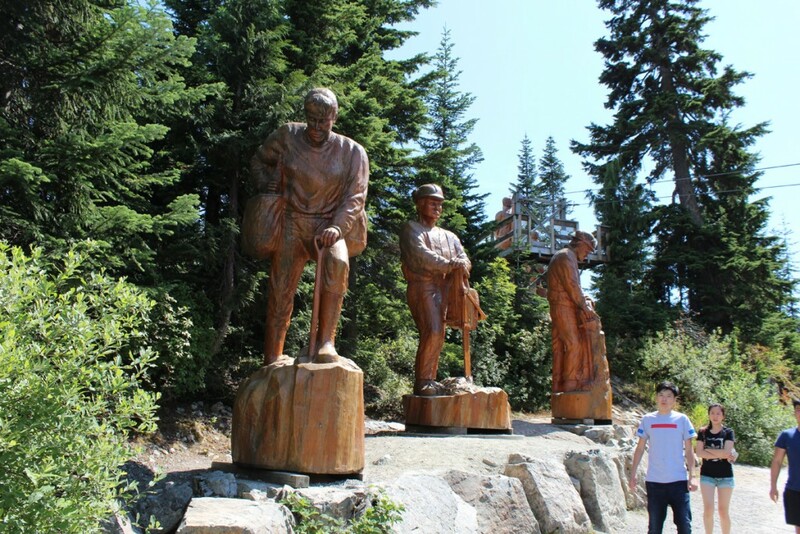 The other one is not far from the wooden carvings of the tree planters. 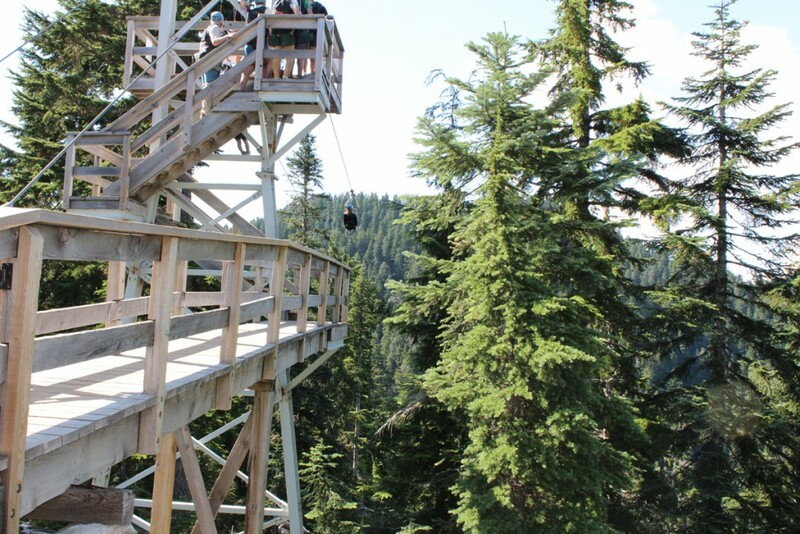 The upper zipline crosses a canyon. 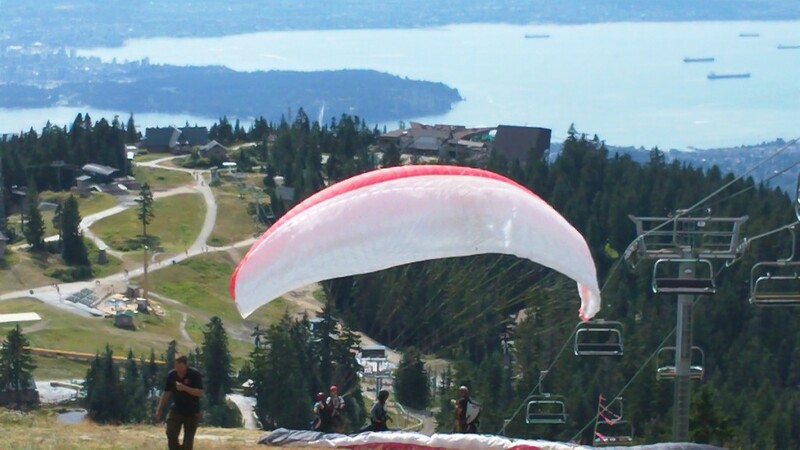 The lower one soars over a mountain lake. 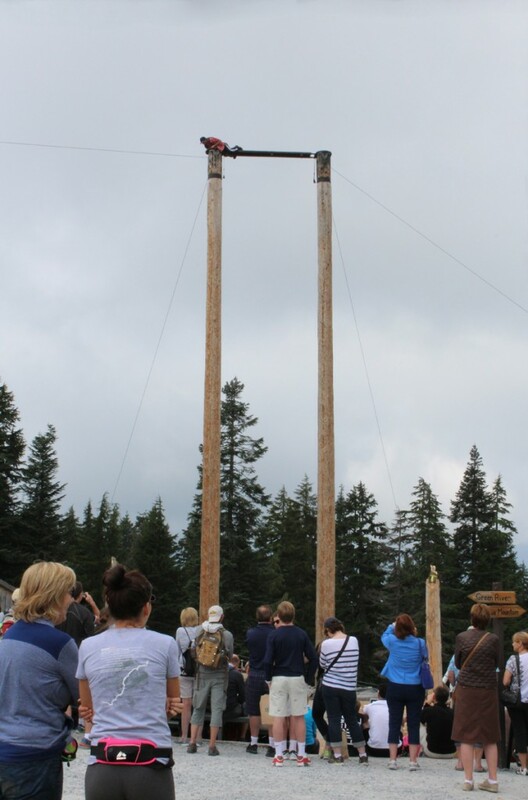 The zipline. You can see a rider just starting his trip across the canyon. The side of the Peak slopes down at a moderate angle from the top and you’ll often find hang gliders launching from there. Fun to watch from above, as well as from below. 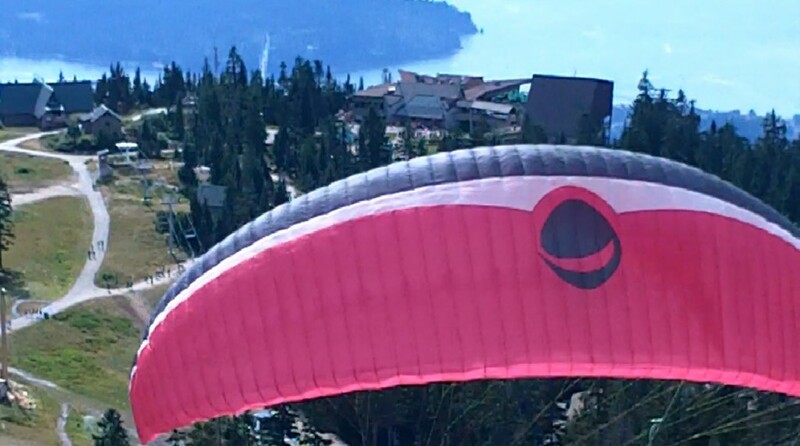 A hang glider launches from the side of the Peak. Another lies on the ground as the next flyer preps for takeoff. Janis at the top of the Peak. The view is spectacular. 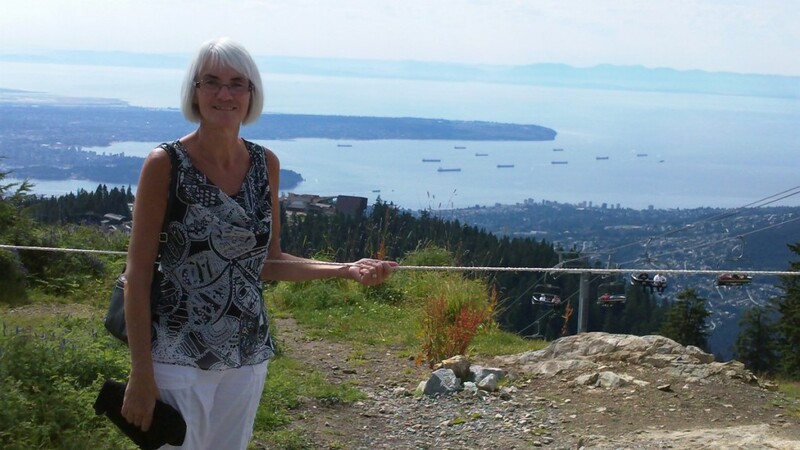 Behind her is Stanley Park and the finger jutting out into Georgia Strait is Point Grey, home of the University of British Columbia. Taking the chair down again we headed left to an outdoor amphitheatre for the Birds in Motion show. This is my favorite show on the mountain. 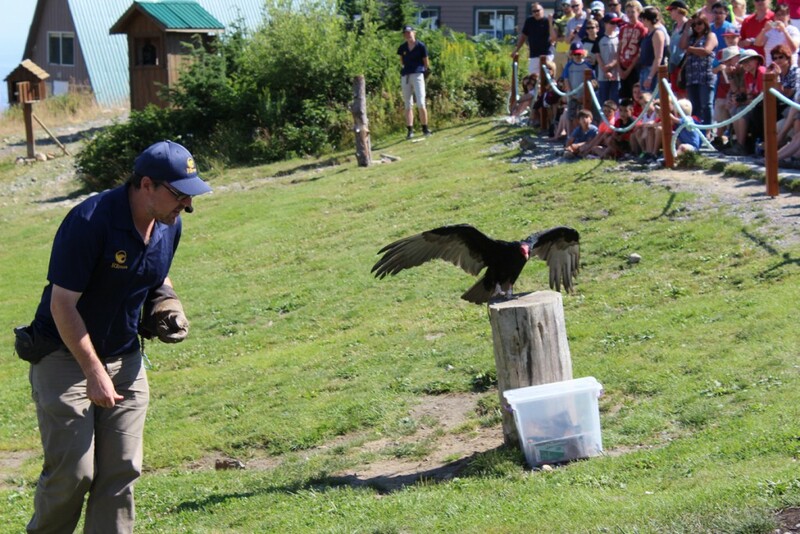 Several naturalists bring out a variety of flying raptors in turn and talk about these fabulous birds as they put them through some flying exercises. Heading back on our first visit, we wandered around the lake the lower zipline soars over. 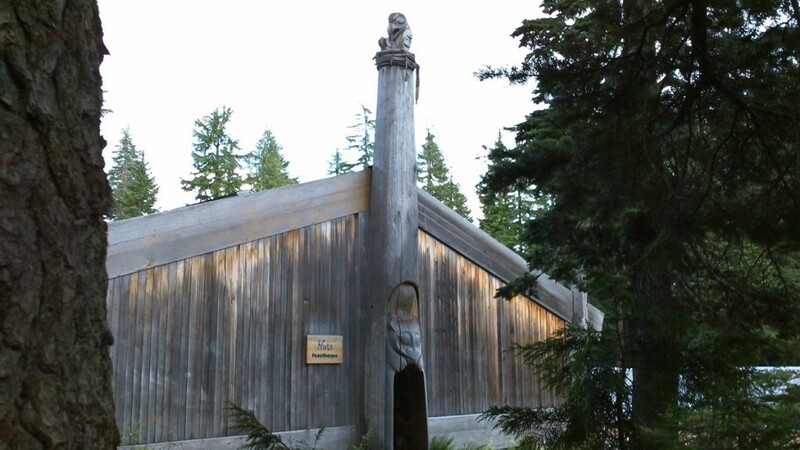 It is a peaceful quiet walk featuring some aboriginal outbuildings. A nice way to end your day. 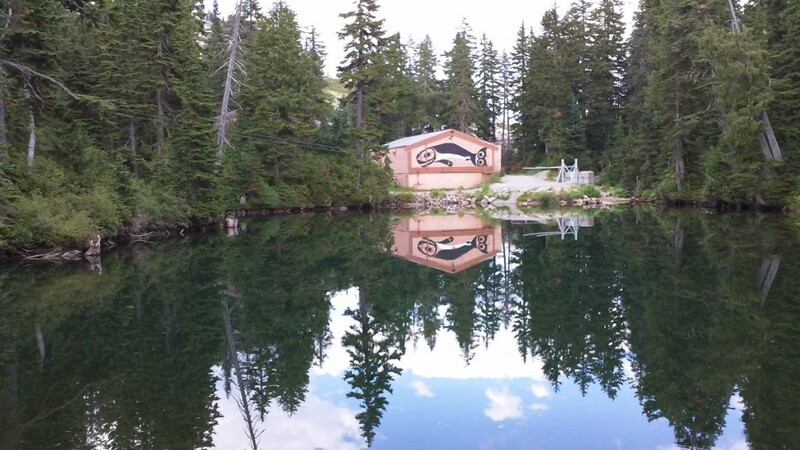 A native longhouse alongside the lower lake. 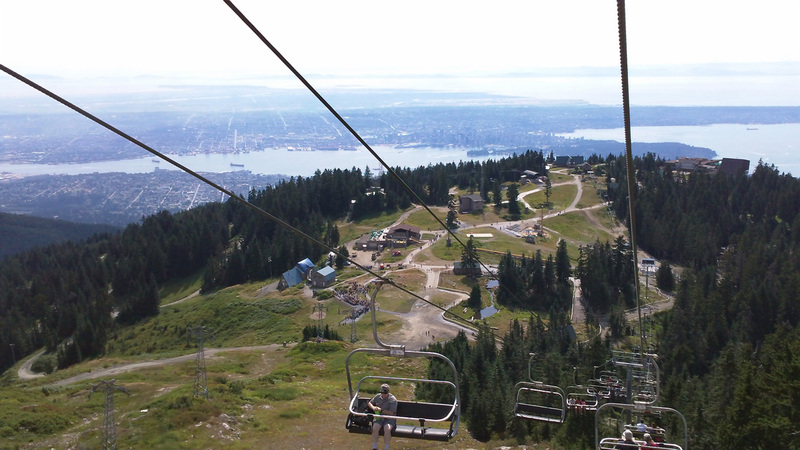 Grouse Mountain is a fun ski destination in winter, but personally, I prefer it in summer. I took a lot of pictures on both occasions we were there so I’ll add two photo albums. 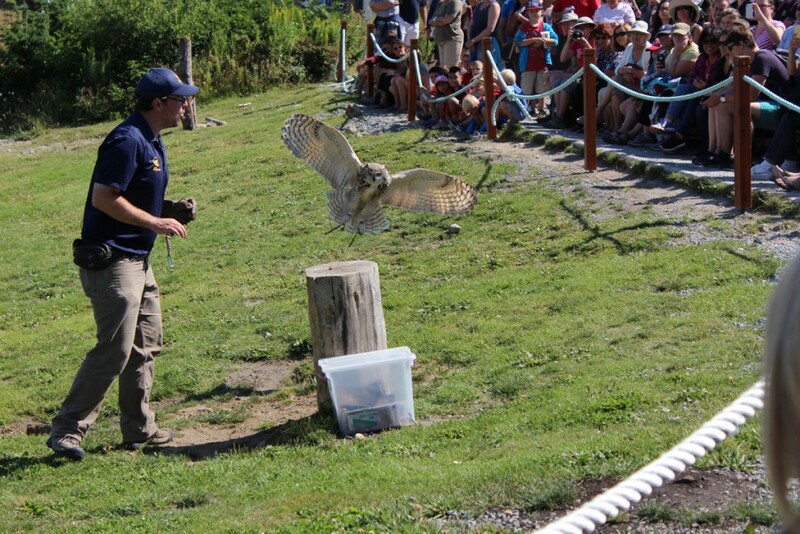 One is just of the Birds in Motion show which includes a number of video. The other is of the other sights around the mountain. 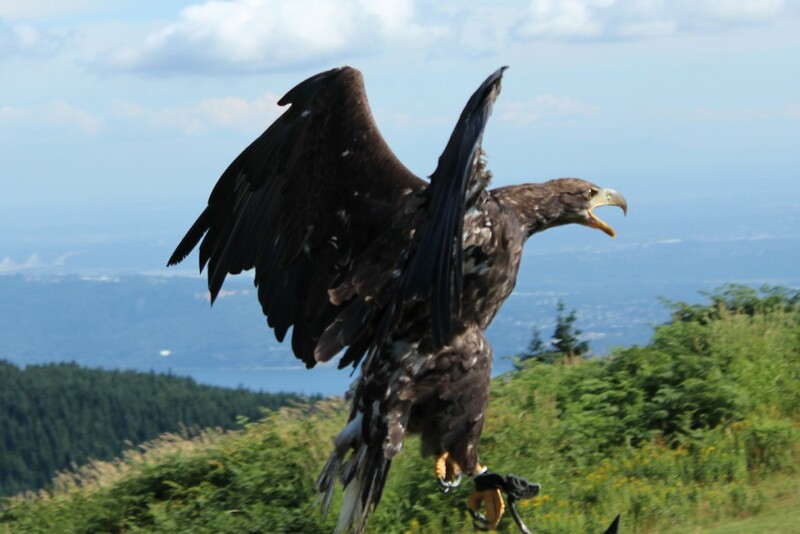 Here are some additional photos and videos of the Birds in Motion show at Grouse Mountain. 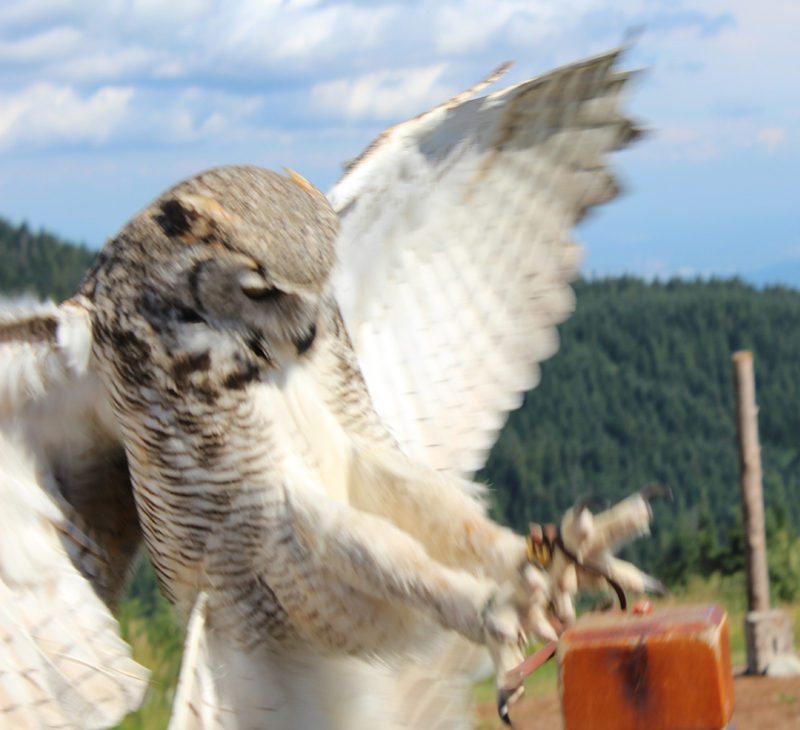 The great horned owl flies towards the stump. 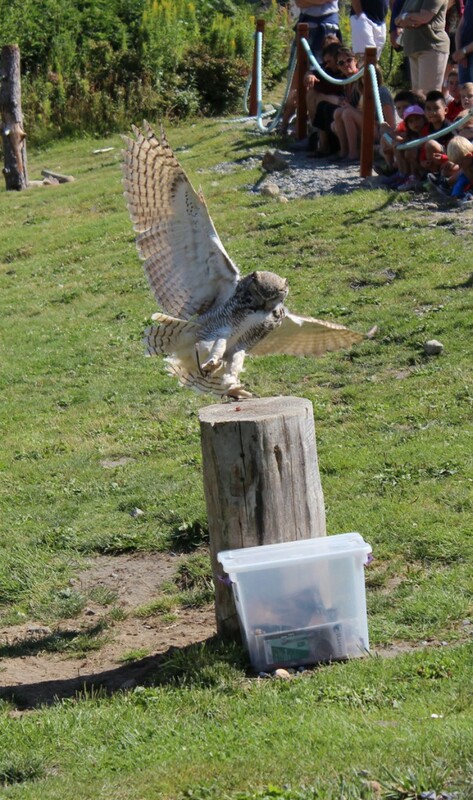 In 2012 I caught the owl coming in for a landing on this post right in front of us. 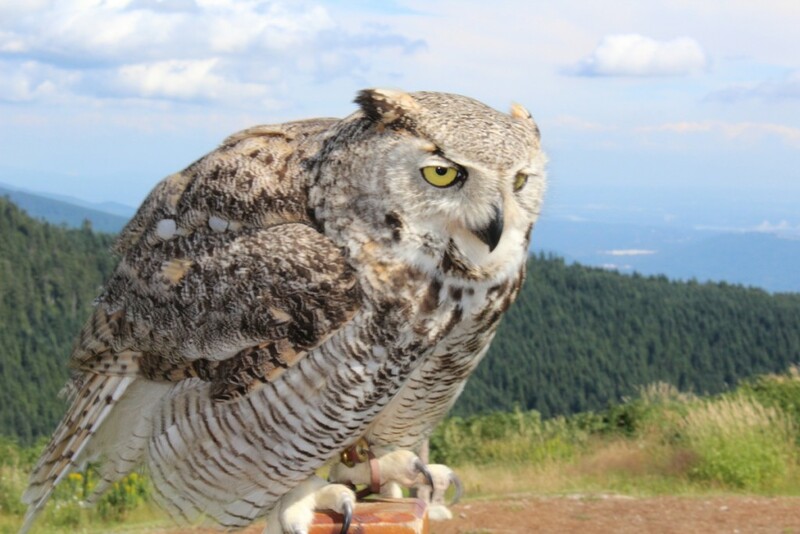 Nice close-up of the owl. 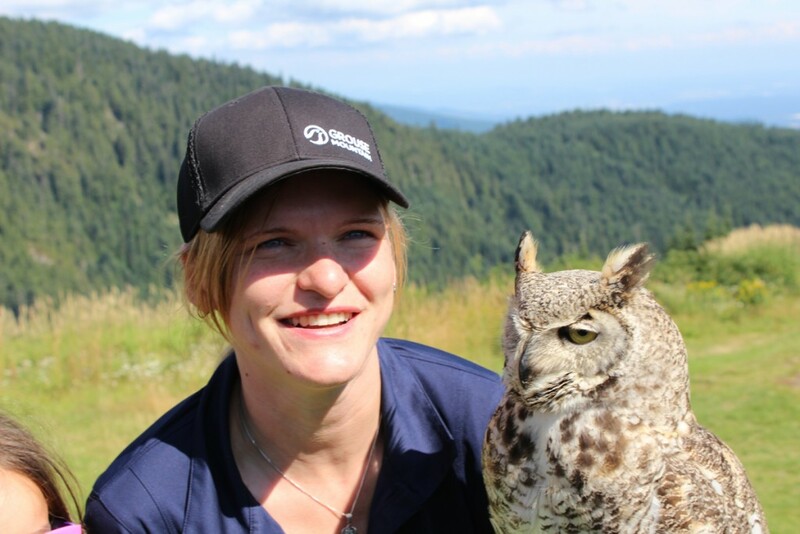 Getting up close and personal with the owl. 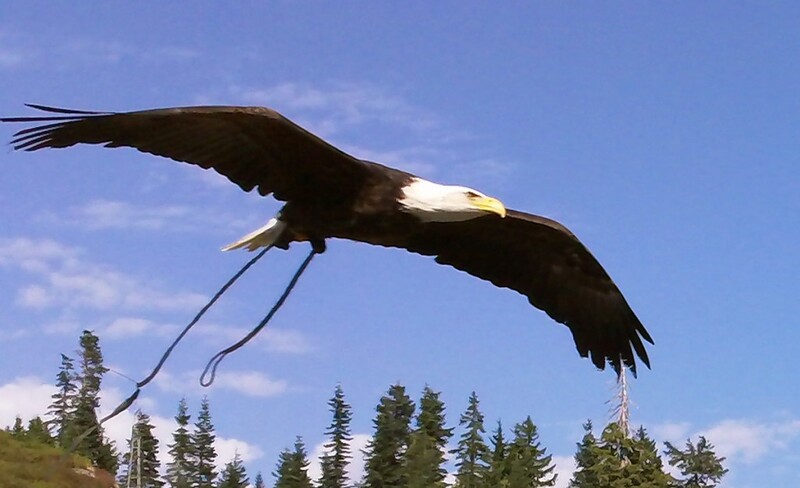 On our visit in 2012 they had a mature bald eagle with it signature white head. 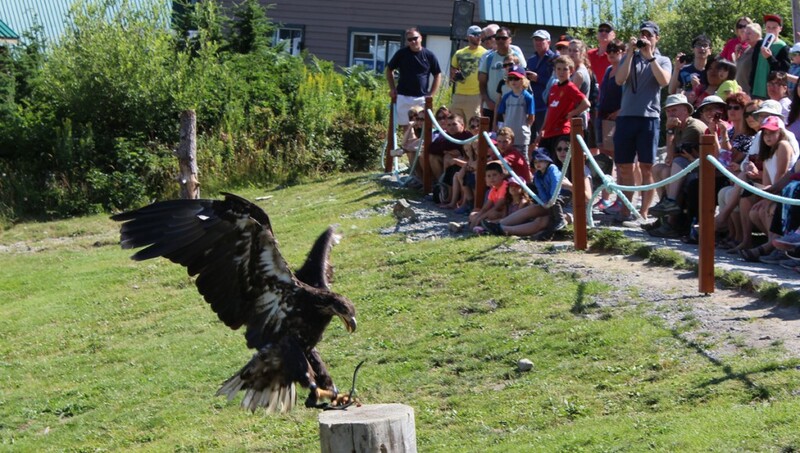 On our 2015 visit, it was a younger bald eagle whose top feathers had yet to turn white. 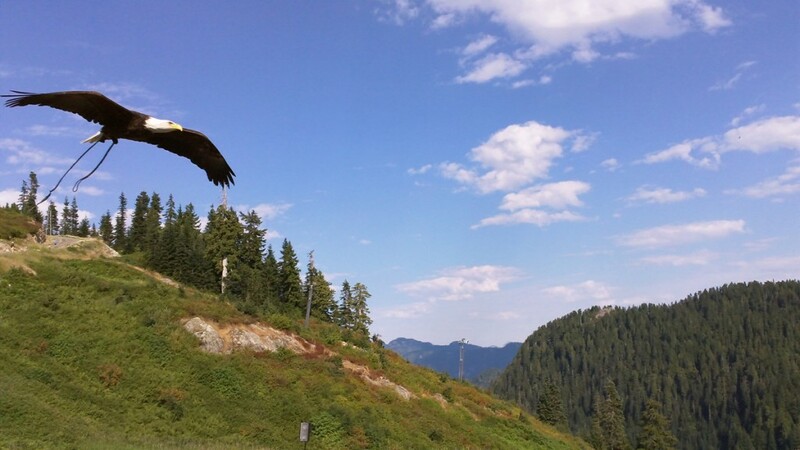 Bald eagle in flight. This was in 2012. The above photo cropped to a close-up view. 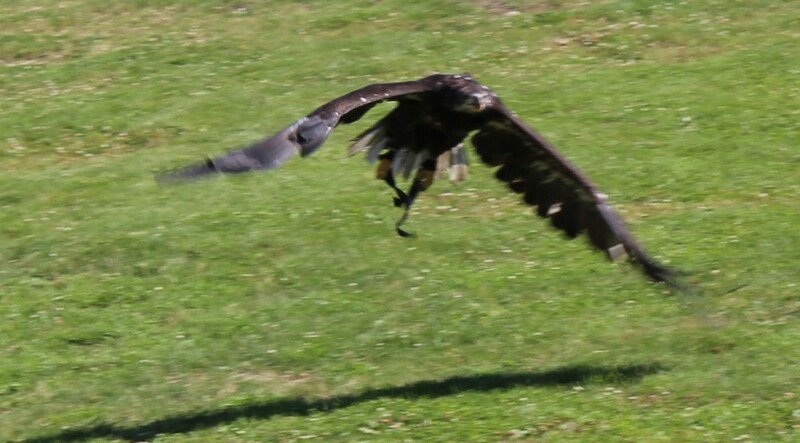 Juvenile bald eagle and his trainer. This was in 2015. 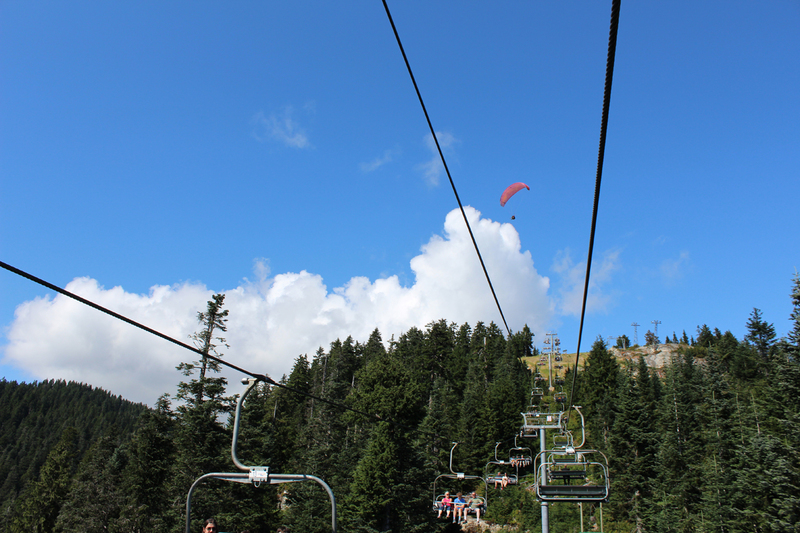 Be sure to check out the other photo gallery of Grouse Mountain in the summer. 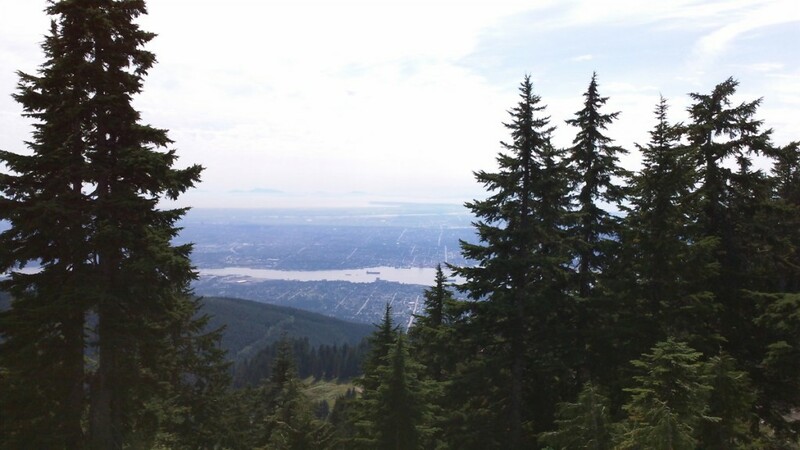 Vancouver from the top of the Peak. Lumberjack at the top of a spar. He stands up at the top. The crowd holds its breath. 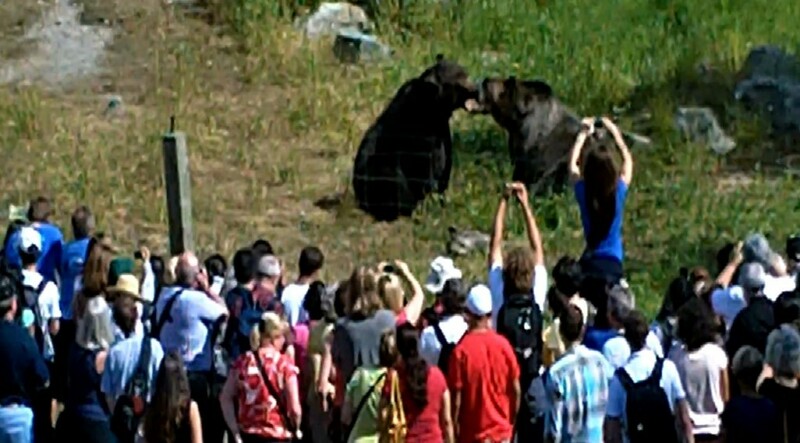 The grizzly bears are a popular attraction. 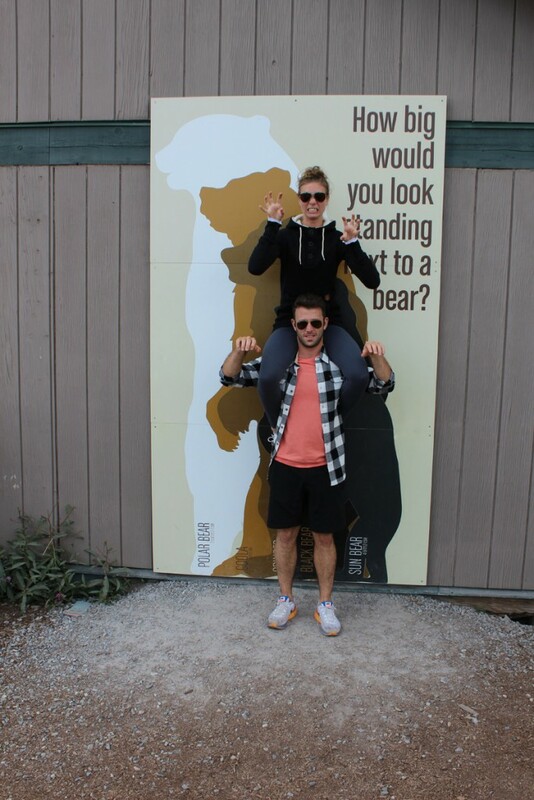 How do you measure up to a bear? Together Jamie and Sarah have the height of a coola or grizzly bear. 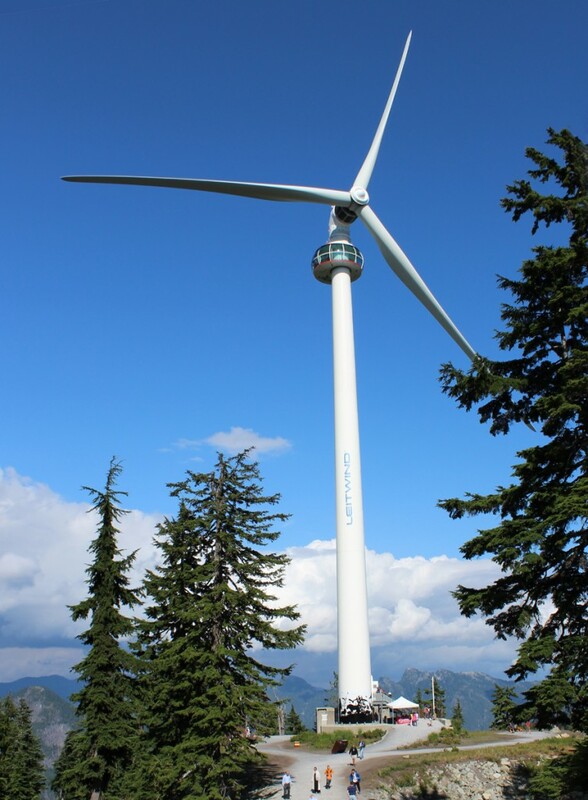 The Eye of Vancouver is an observation deck near the top of the wind turbine at the top of the Peak. 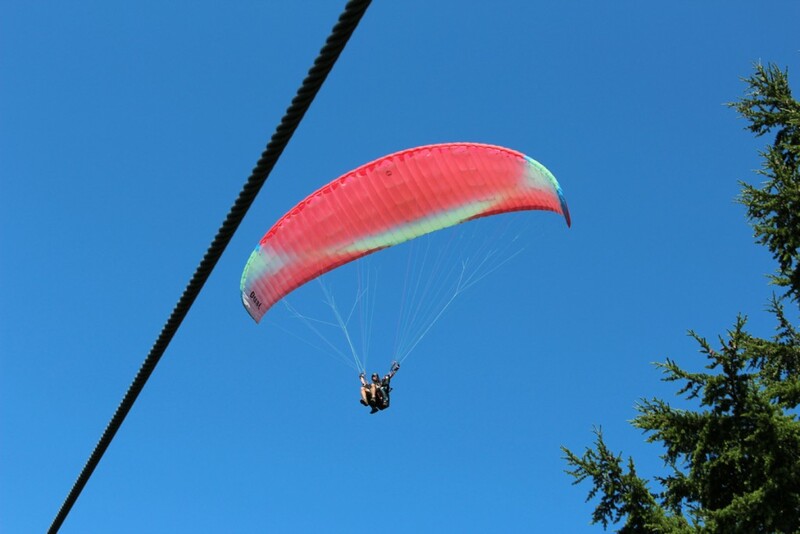 As we go up the chairlift, a hang glider flies over. A hang glider lifts off. 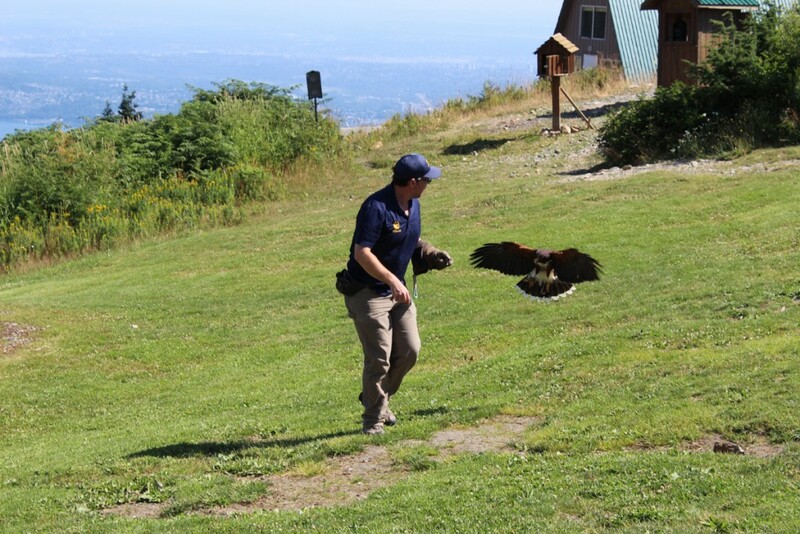 They land far below at a park near Cleveland Dam. 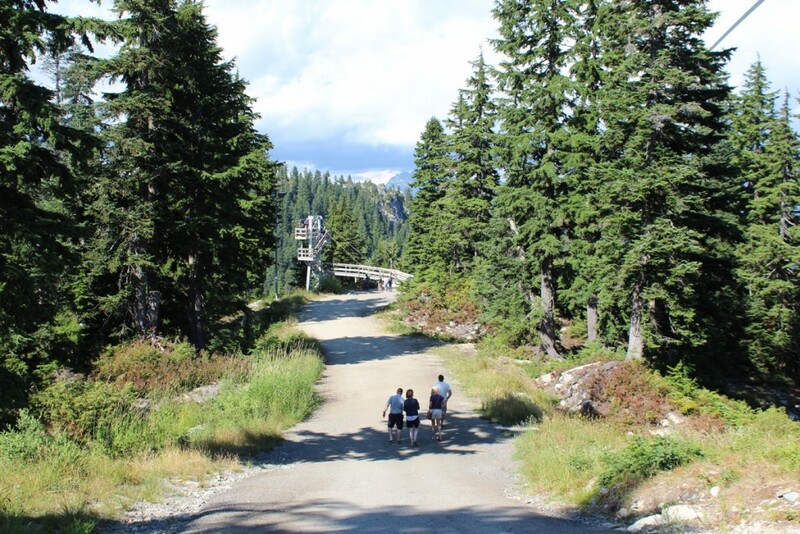 From the chairlift, a trail leads to the zipline. The Eye of Vancouver is just off to the right. Looking down at the zipline launch site from the base of the Eye. The view from the top is breathtaking. The city through the trees. 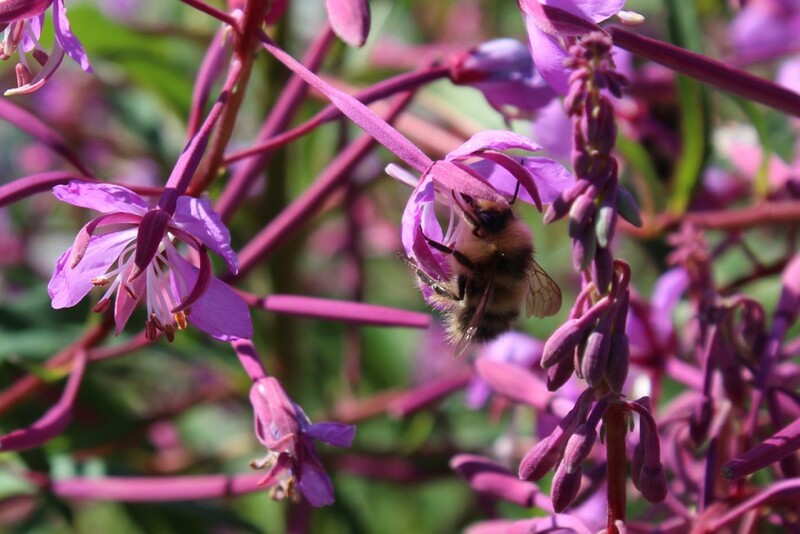 A bee explores some of the many wildflowers growing on Grouse Mountain. Down below again – the other side of the native longhouse. And we pass the wood carvings again. 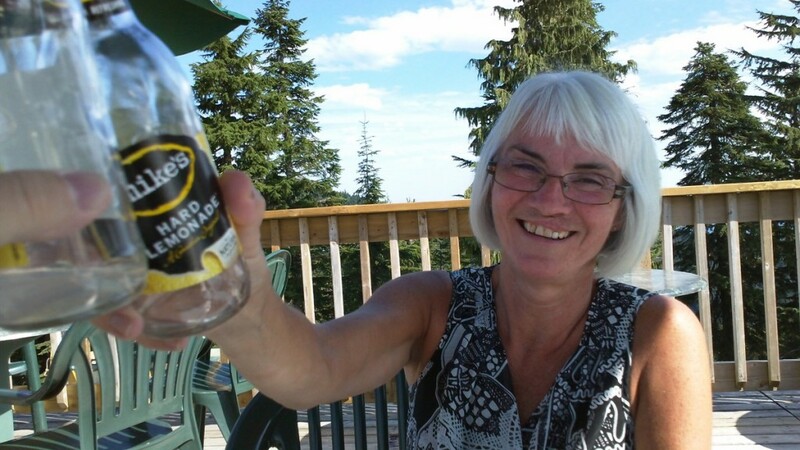 A toast to a fine day on top of Grouse Mountain. 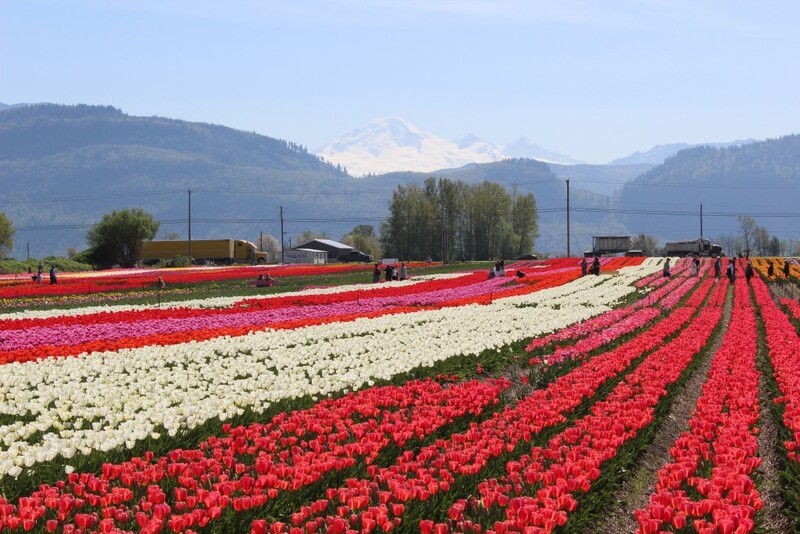 The annual Skagit Valley Tulip Festival south of the line in Mount Vernon, Washington has been a huge annual event for years. 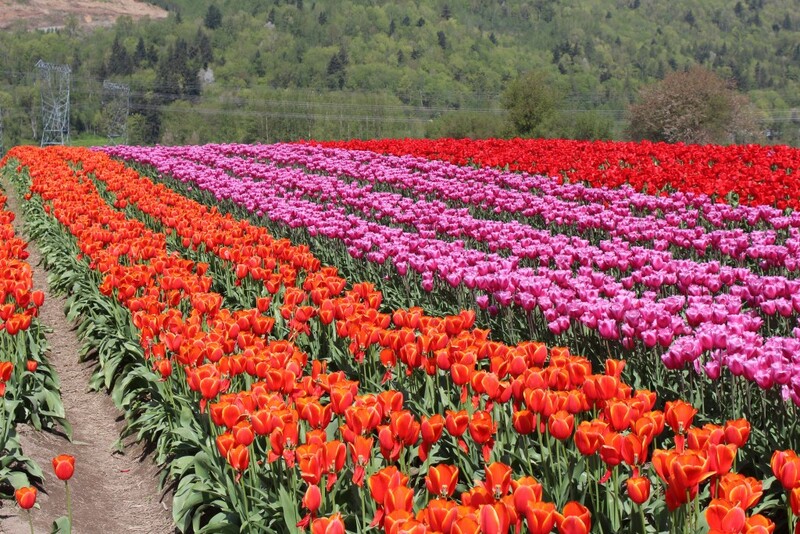 Now a local Abbotsford farm has created the Abbotsford Tulip Festival, also running throughout the month of April. Last Friday my wife and I decided to check it out. 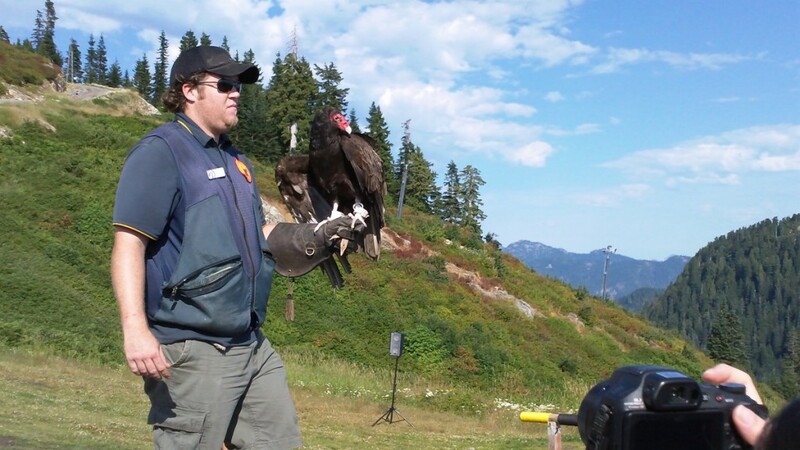 Compared to the Skagit event which comprises many farms and covers 300 acres, the Abbotsford event is a small affair – around ten acres. And there is an admission charge of $5 a person. 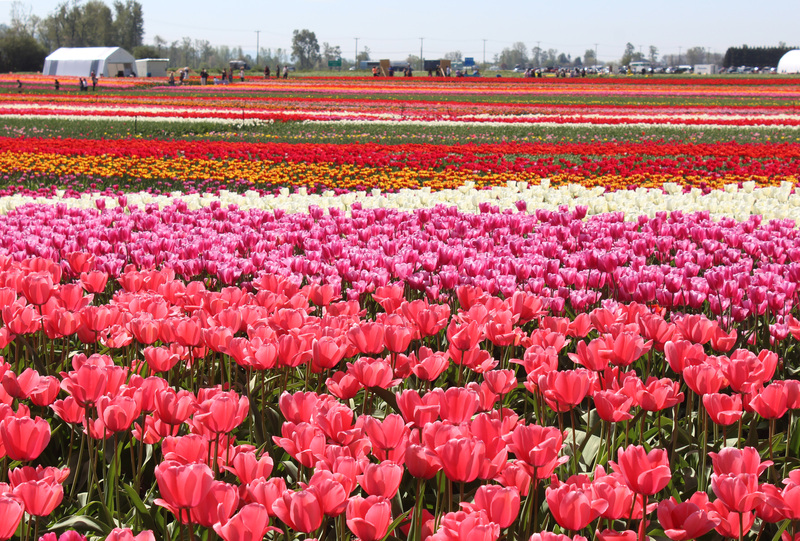 Nevertheless, we had an enjoyable visit and it is worth checking out if you want to see fields of tulips but don’t want to travel to the USA to see them. 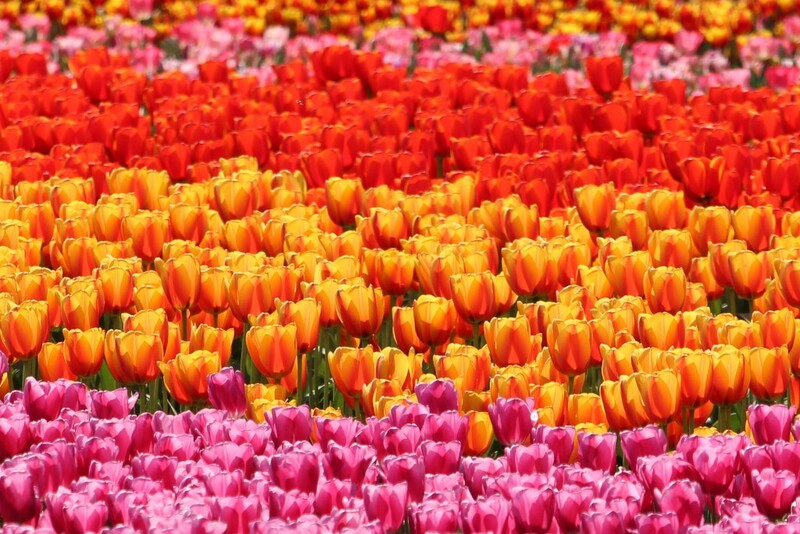 A blaze of colour in the Fraser Valley! 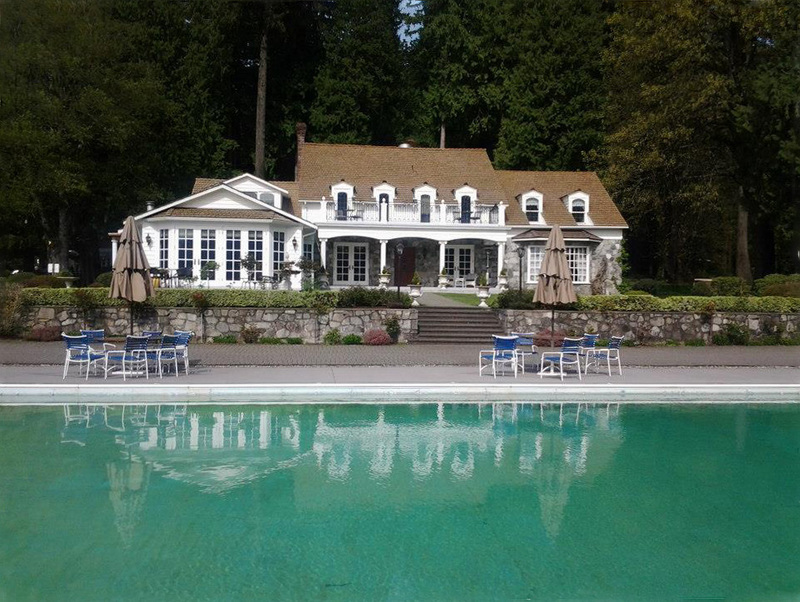 The farm is on the North Parallel Road in eastern Abbotsford, just past Castle Fun Park. Just take the Whatcom Road exit of Highway # 1, head north cross the highway and immediately turn right onto the North Parallel Road. It is just up the road a bit. There is plenty of parking on a gravel covered lot. Admission includes parking. Near the parking lot is a large tent with picnic tables, a bank of porta-potties, and a collection of amusements for children including rubber duck races, bean bag toss and tetherball. 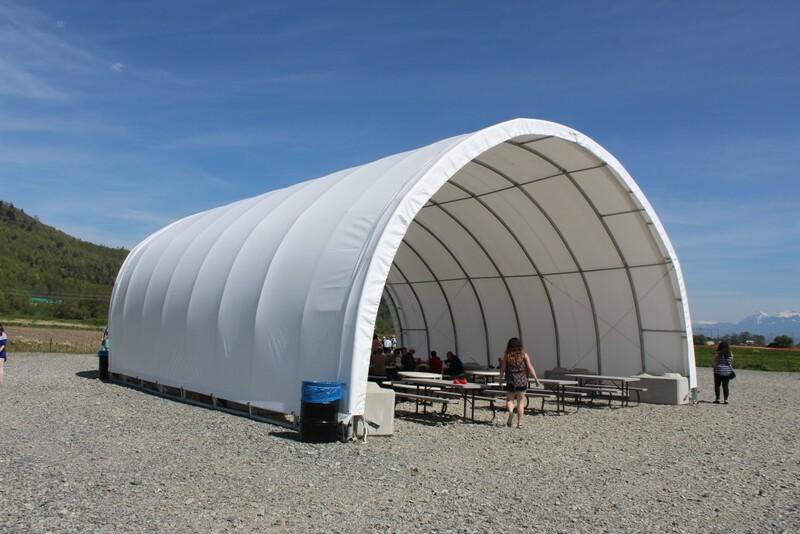 Picnic tables covered by a large tent as well as amusements for children make up some of the facilities. 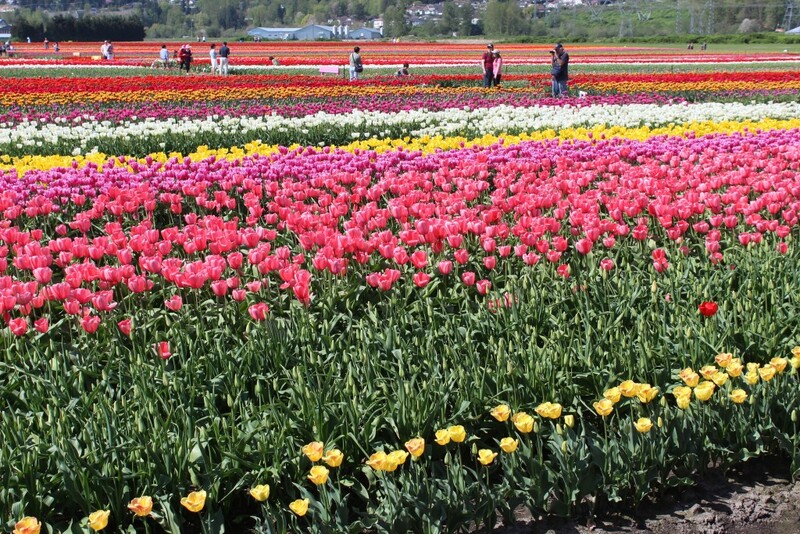 From this staging area, you walk along a woodchip covered path to the tulip fields. Along the way you pass crates of tulips of different varieties. There are also a lot of park benches along the way. 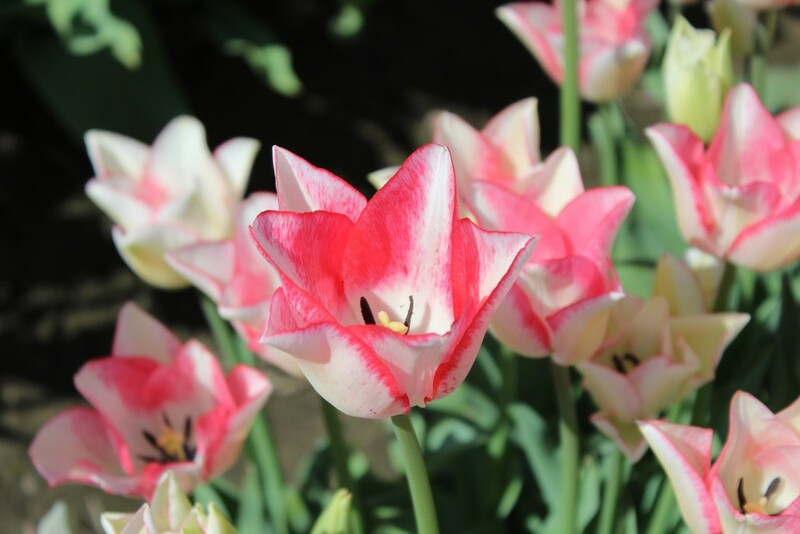 Along the woodchip covered walk to the fields are containers with different varieties of tulips. A short jaunt and you’re at the fields. 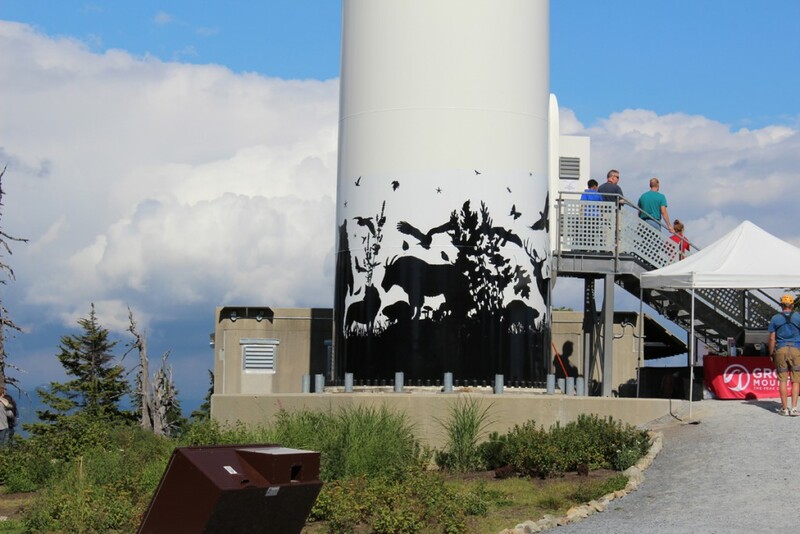 They cover ten acres that are visible from the highway. 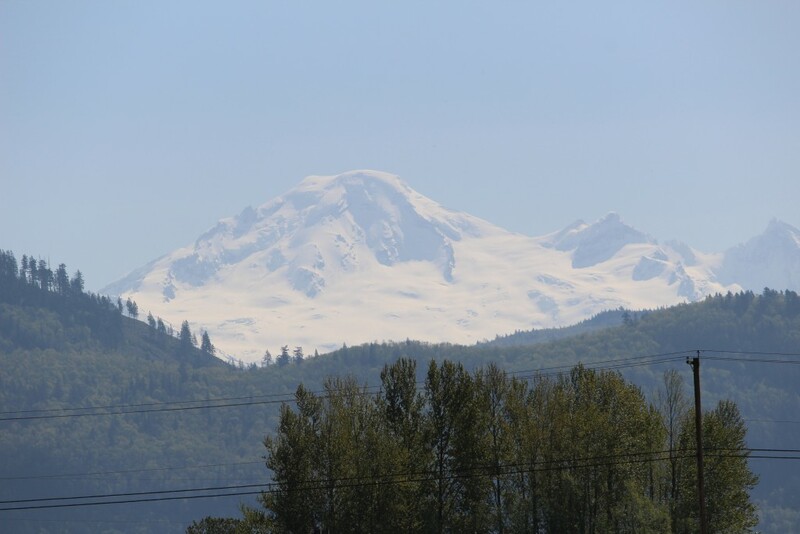 Mount Baker serves as an attractive back drop to the south while Sumas Mountain forms a backdrop to the north. 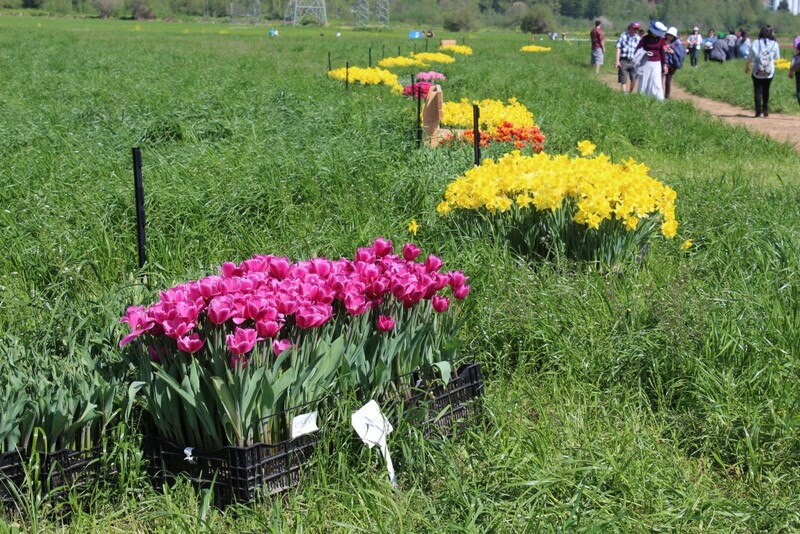 We walked along the figure eight walking path through the fields admiring the many different varieties of bulbs. Most were blooming though there were a number of rows not yet in bloom. Most of the blooms were out when we were there on April 8th, but some. like those in the foreground, had yet to blossom. In any event, pictures tell a better story than words so I’ll just end with a collection of photos. 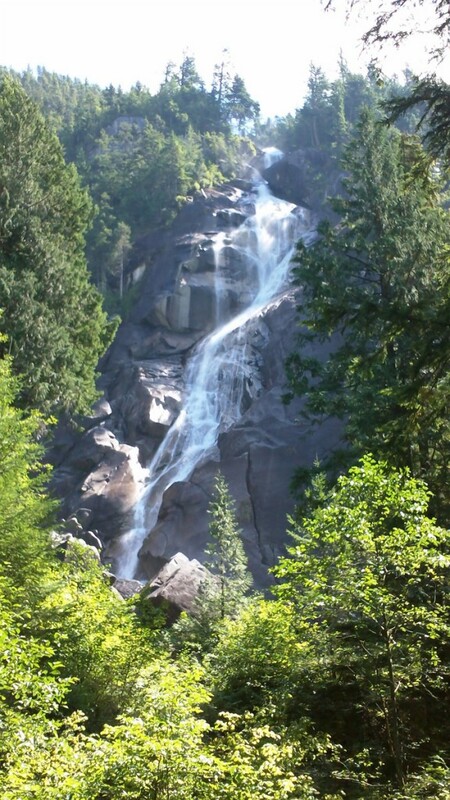 If you’re in the greater Vancouver area, just head east on Highway # 1 to the Whatcom Road exit. 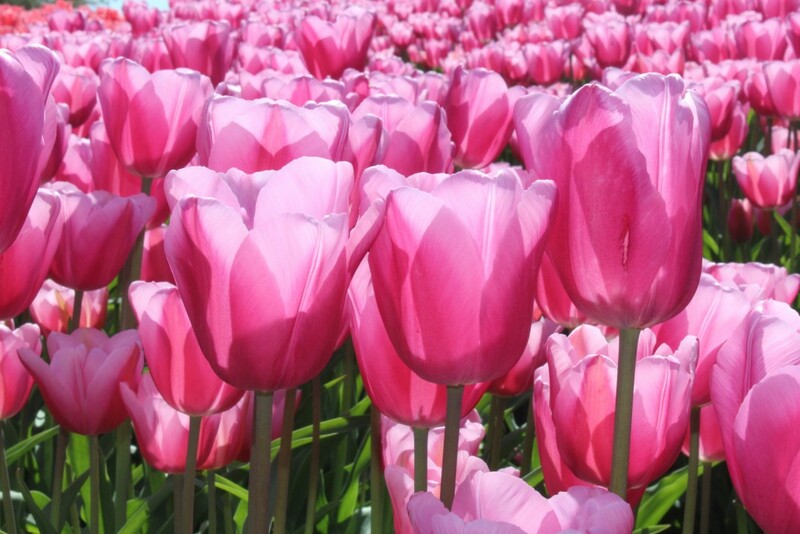 If you’re a flower lover, it’s worth the trip. 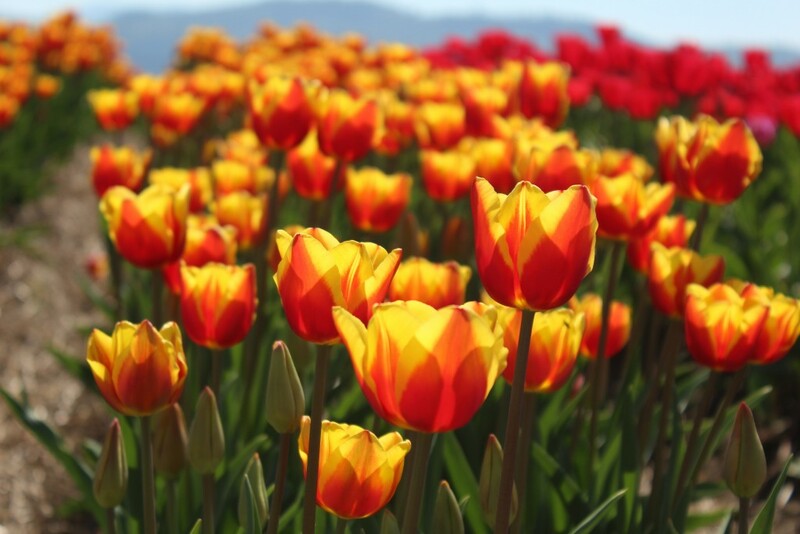 Check out their website, Abbotsford Tulip Festival, for more. 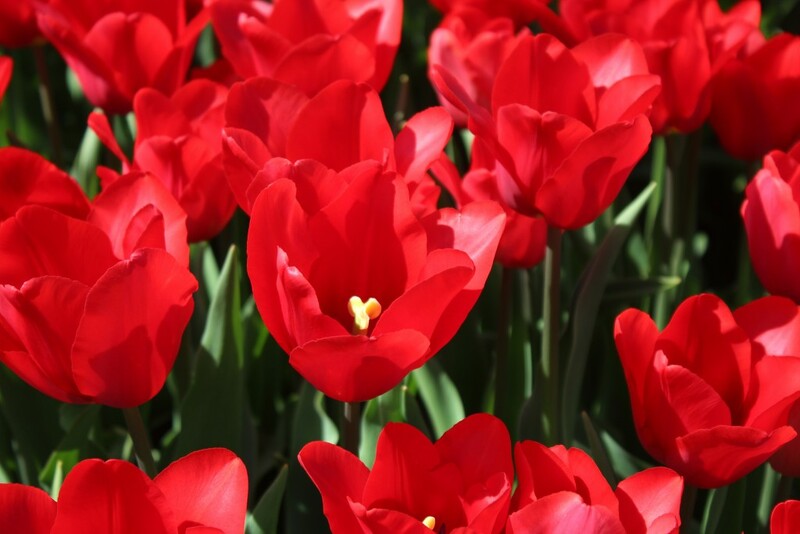 Close-up of one of the myriads of tulips in bloom. Many vibrant colours are a feast for the eyes. 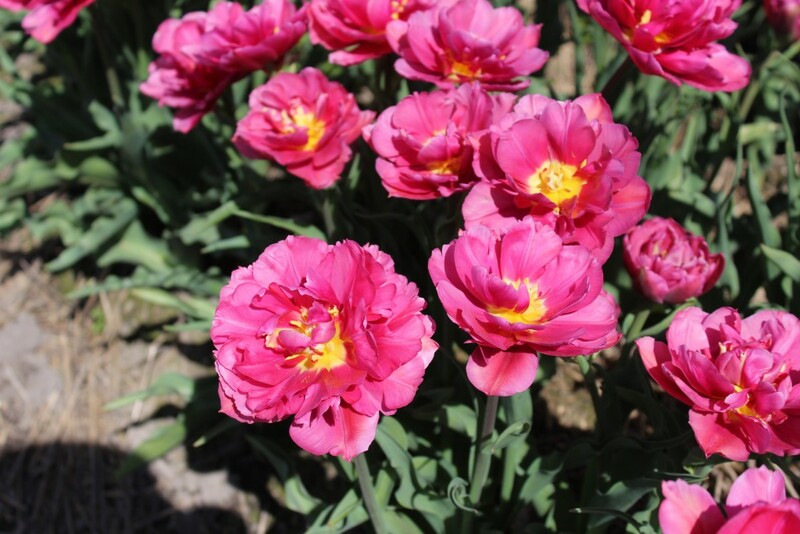 These are Margarita Tulips, a bit of a different shape for a tulip blossom. 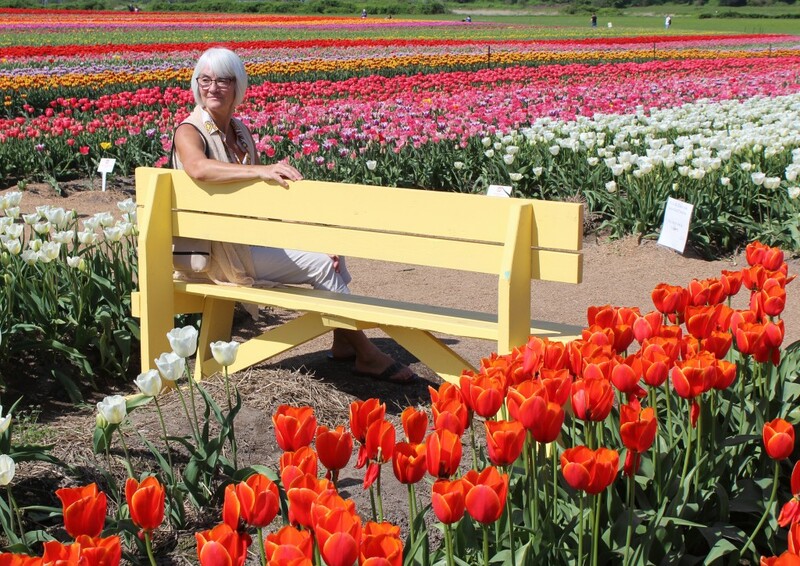 Janis, sitting on one of the many benches, surveys the flowers as well as Mount Baker. Beautiful Mount Baker just south of the border. 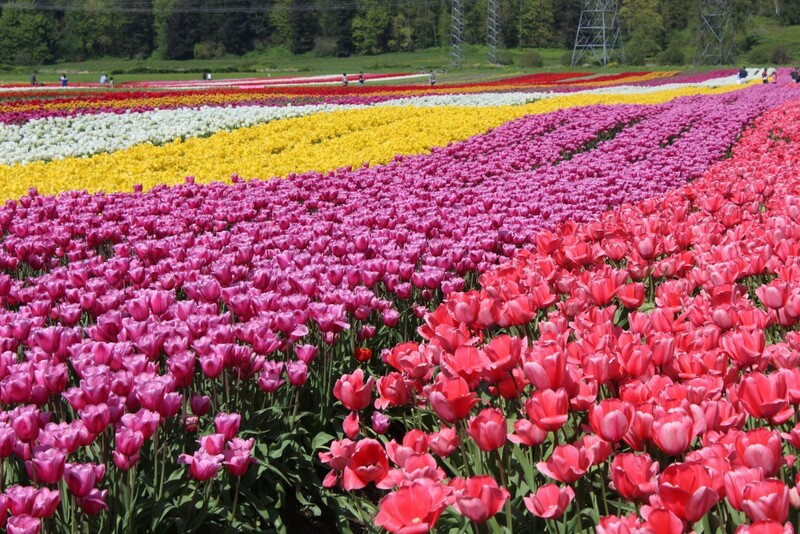 We will undoubtedly check out the Abbotsford Tulip Festival again next year!